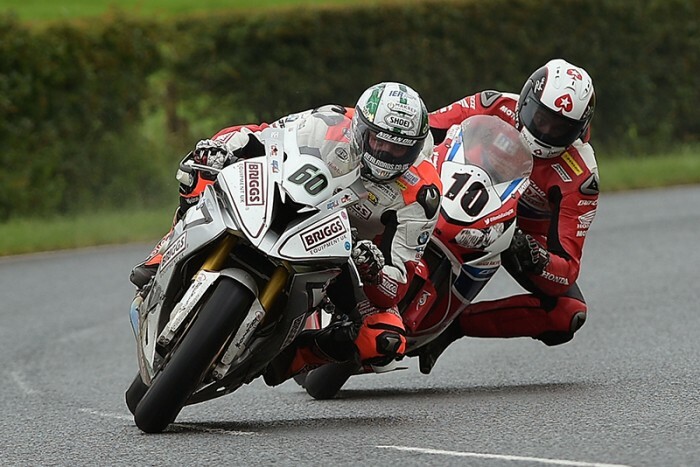 Peter Hickman claimed his first ever International race win on Saturday when he won a thrilling second Superbike race at the Ulster Grand Prix. Riding the Briggs Equipment BMW, Hickman led from start to finish but was under intense pressure in the closing stages from Conor Cummins and there was just 0.028s between them at the chequered flag. Michael Dunlop took third. “What can I say, it’s been a brilliant, brilliant day and to be sitting here now with an International road race win – and a Superbike one at that – is mega. I knew it was tight in the race as it had been all day and had a feeling there was about four or five riders behind me. Conor pushed me really hard on that final lap and I had to ride harder than I wanted to through the final corners. I saw on the big screen TV how close he was though and I had to do that to take the win,” said Hickman. “I was already peaking after taking second place in the Superstock race even though a slight lack of experience cost me the race win there. I was a bit tentative going into Quarry Bends which allowed Lee to get by but second was still a great result. The Briggs Equipment BMW was also really strong in the feature Superbike race and I genuinely thought I could have got the win. I’d just set the fastest lap of the race at 133.3mph and thought I’d be awarded third but the result went back two laps rather than one and I ended up fourth but I can’t complain. Heavy rain had left the circuit wet but the rain had stopped by the time the race started although it was cut to four laps and it was Hickman who grabbed the lead the minute the lights turned green. He maintained his advantage all the way round the lap and led Dunlop by 0.8s with Keith Amor showing well in third. Dan Kneen was in fourth and Cummins fifth. Second time around and Hickman’s lead stayed the same but Cummins was now up to fourth and Russ Mountford fifth as Kneen slipped back to sixth. Meanwhile, Ian Hutchinson was an early retirement. On the third lap, the leading quartet started to bunch up and there was just 0.6s between Hickman, Dunlop and Cummins with Amor still well in contention in fourth. Hickman continued to lead and any hopes that Dunlop had of taking the lead were thwarted when Cummins got ahead of him before the Windmill. The Manxman edged ever closer to Hickman for the remainder of the race and tried on more than one occasion on the final run to the line to move ahead. Each time Hickman just did enough to keep him behind although it was tight and Cummins tried the inside line as they took the chequered flag. It was Hickman who got the verdict though for a stunning win with Cummins, Dunlop and Amor flashing across the line in close formation. Mountford held on for an excellent fifth ahead of Kneen, Derek Sheils, Dean Harrison, Daley Mathieson and William Dunlop.